No, Melbourne is not just off Japan. It's in Australia. 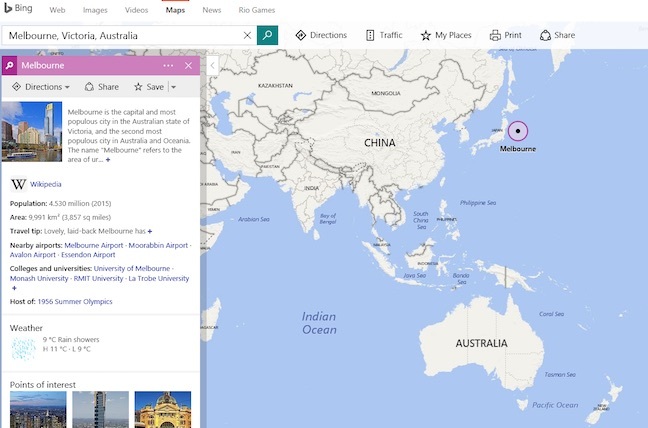 Microsoft has misplaced Melbourne, the four-million-inhabitant capital of the Australian State of Victoria. A search on Bing Maps for “Melbourne, Victoria, Australia” says the city is at 37.813610, 144.963100 which we've screen-captured above (or here for those reading our mobile site). The co-ordinates are right save for one important detail: Melbourne is at 37.8136° South. Bing's therefore put it in the wrong hemisphere. The Register's Australian outpost has tried searching for a few other major cities in Victoria and beyond and believes this is an isolated and probably-fat-fingered error. If you know better, hit the comments. Hat-tip to reader James M who spotted the SNAFU.